Please welcome back guest contributor Don Pillsbury. Don’t I need to be a “Jock” to ride my bike to work? When co-workers see me riding my bike to work, they often assume I’ve always been some sort of athletic super hero. And while riding does occasionally simulate the sensation of “flying,” I’m no Superman. I’ve never participated in any organized sport (well, except for the office volleyball league) and I don’t follow any professional teams. People familiar with my younger years are always surprised to hear about my cycling adventures. As I meet other bike commuters, that pattern seems oddly common. A co-worker, who commutes 12 miles throughout the year, in all sorts of weather, said she hated gym class in school – she was always the last one selected for any activity. This same person became indignant when asked about her commute being exercise. To her, it was about saving money. A friend, who also commutes 12 miles year round, doesn’t mention his cycling during a routine annual exam with his physician and is then shocked when the doctor suggests the need for exercise – despite his trim physique. For the bike commuters I meet, cycling isn’t exercise it’s just a means of getting to their destination. One other trait I’ve noticed: the complete lack of remorse about eating whatever they want. What is your background? If you commute with your bike, some or a lot, please let me know whether you consider yourself athletic or not. I can be reached at: drPillsbury@comcast.net. Thanks Don! If you’d like to write a guest post, pls email wwbikeped@gmail.com. Please welcome Brian Clissold as our guest commuter this week, a trustee of the WWBPA and a resident of East Windsor. A version of this post appeared on his blog, Roadmaestro. Brian, what’s your secret? Here it is…wait for it….wait for it………CONSISTENCY!! Yep, that’s it. That’s my big piece of advice for folks who want to commute by bike. Just like any other lifestyle change, it’s the act of doing it over and over, until it becomes routine, that makes it part of your life. Now, it’s not that easy. “Sticking with it” is all rainbows and unicorns. What it really means is getting into the routine the night before, or even the week before, by packing clothes, packing lunches, mid-morning snacks (I always get hungry by 10 am when I commute), baby wipes, figuring out the timing, the logistics of parking, when you’re going to apply make up (if that’s necessary), bicycle maintenance, and what to do with all the extra cash you’ll be saving by not buying gas. Whew! It doesn’t sound so easy after all. If you’re content with just learning this concept and can figure out the details, you can be done reading now and go for a bike ride. If you need some more tips, read on. My ride is just long enough that I prefer to ride in bike clothes rather than my work clothes. So, Sunday night I try to make sure I have enough bike clothes clean for the week. I also make sure I have a day or two of work clothes. The weekend is also when I do any touch up maintenance: pump up the tires, lube the chain, make any minor adjustments, etc. Lights get charged and fresh batteries as needed. Each night I pack my bike bag (one rear pannier, or a bag that mounts to a rear rack on my bike) with the next day’s work clothes, hair goop, a towel, my headphones, reading material for the train. Much of this stuff just stays in the bag. I also bring in my thermos and water bottle from my bike, and make the coffee so it starts automatically in the morning. In the morning, I shower, pack my pannier the rest of the way with my lunch, put on my bike clothes, fill my thermos and water bottle, turn on the lights, and head out. Once I reach the train station, I put my bike in its locker, go into the station and change into my work clothes, and get on the train. I take my stuff with me to the office so I can hang my clothes to dry. Also, I change back into my bike clothes in the train bathroom on the way home so I can get right on the bike and get home. So this is kind of a lot of work, but I’ve been doing this long enough now that it is more of a nuisance to change out of the routine than to stick with it. The rare days that I have to drive to work really throw me off now, both in terms of the routine and also in my mindset. Driving is such a headache! I should definitely add that my routine is supported by my amazing wife Abbi, who helps me out in a variety of ways, such as putting away leftovers in single serve containers to make it easy to toss them in, doing laundry, and being generally supportive! Thanks Hunny!! There are a million tips for bike commuters, especially for newbies. 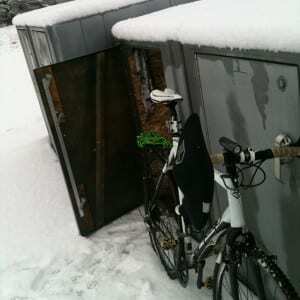 I highly recommend spending some time on the blog, bikecommuters.com There is lots of good stuff there, from equipment reviews to riding tips for bad weather. Go pack your stuff and start to make riding to work part of your daily, weekly, and monthly routine. It is an amazing lifestyle choice!! 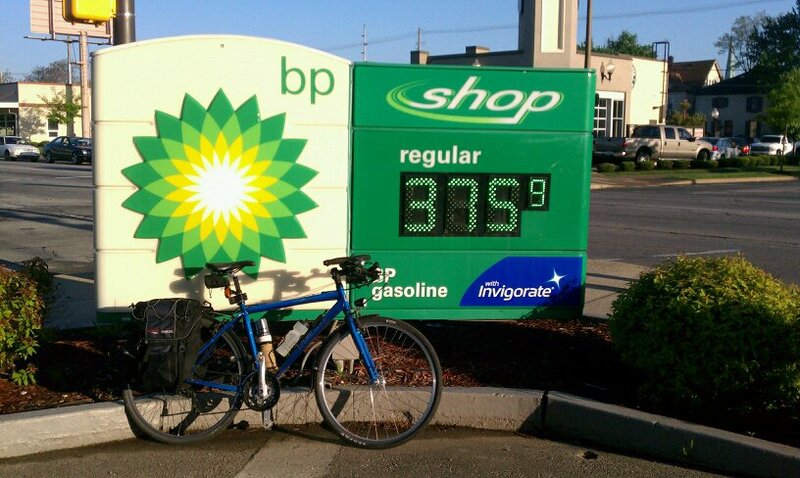 Thanks Brian – if you’d like to share your bike commuting stories, please email wwbikeped@gmail.com. Please welcome Kiyomi Camp, who also serves on the Princeton Free Wheelers bike club board, as our guest commuter this week. When I was in high school and college, I used to ride my bike everywhere, both for transportation and for pleasure. As an adult in semirural Montgomery, New Jersey, that didn’t really seem like an option, especially after my kids were born. I lived on a 2-lane highway 4 miles from the nearest commercial area and about 8 miles from my workplace and the kids’ school. Then I went to my 30th college reunion. Seeing all the people riding bikes at the college brought back happy memories. I resolved to try riding my bike to work, at least during the summer when I worked shorter hours and didn’t have to chauffeur kids. The route I worked out involved riding on the towpath for 3 miles then taking to the streets. At the time, I only owned a mountain bike. The first climb up Mt. Lucas on knobby tires nearly killed me, then I had to climb Cherry Hill Road! I changed my route to avoid Cherry Hill, bought slick tires, and eventually got strong enough to make it up the hills without having to stop. My route was about 9 sweaty miles. I work in a school and have access to showers so this was not a problem. My clothes and lunch fit in my trunk bag and I kept shoes and toiletries in my desk. 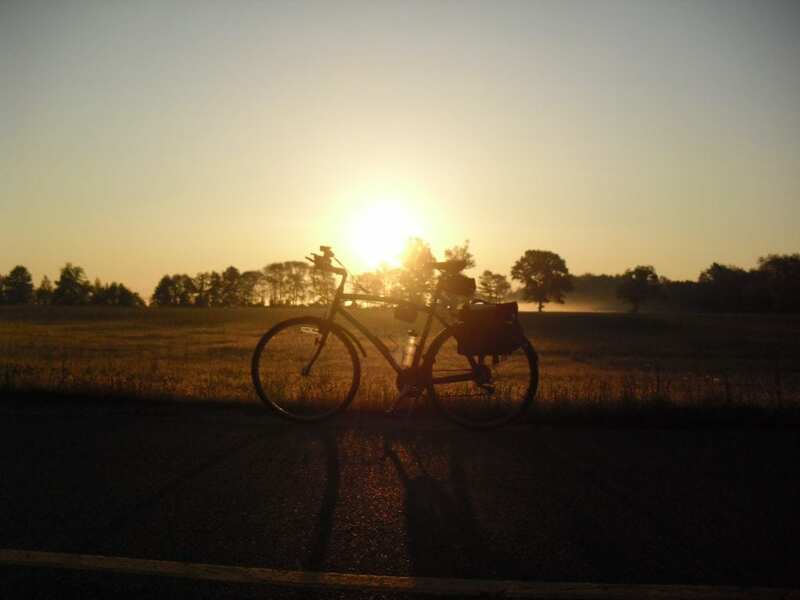 I really enjoyed riding to work during the summers, when I could ride home before rush hour, but I’m a pretty wimpy rider and found the rush hour traffic on my road during the school year was more than I could handle. In 2011, I moved to Hopewell, a mere 7 miles to work but on more heavily traveled roads. From Princeton Free Wheeler ride leaders Diane Hess and Andy Chen, I learned some routes through developments that minimize my time riding on The Great Road. I also make use of the “bike lane” (really, a sidewalk) on The Great Road for the uphill portion of my ride home. My new route turned out to be rideable at rush hour so I can now ride year round although I’m still a wimp and drive if it’s icy or visibility is poor (or if I oversleep.) My ride to work starts and ends with pretty nice downhills. Of course, this means that my return trip starts and ends with some pretty serious uphills, but I can reward myself with a shower and a recovery beverage when I get home. I acquired some different bikes and became addicted to a couple of bike blogs that extolled the pleasures of riding to work on an upright bike while wearing one’s normal clothes. Enamored of the vision of myself riding to work on a stylish bike in my dress and ballet flats, I decided to give that a try. Unfortunately, seven miles with a couple of miles of uphill each way is not really fun on an upright bike. I concluded that I really prefer riding a road bike while wearing bike shorts. I’ve learned to bring in a bag of office outfits on my driving days so that I can commute on my unencumbered “fast” road bike. 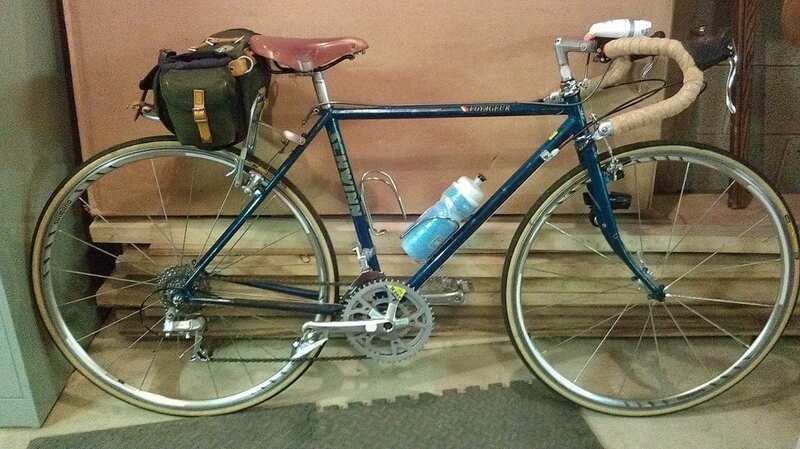 I also built up a vintage touring bike with a Brooks saddle and Carradice bag for days when I want to look picturesque or carry my clothes and lunch. As a wimpy rider, I like to make myself as visible as possible. My bikes sport front and rear lights that are used even in daylight, and my main commuter has reflective tape on the frame and rims. I wear a helmet, use a rear view mirror, and avoid road-colored clothing. I don’t bike to work every day, but I’ve never had a day where I biked to work and wished that I hadn’t. I guess this means I should bike to work more often! Thanks Kiyomi – if you’d like to share your commuting experiences, please contact wwbikeped@gmail.com. Our guest commuter this week is Ted Borer – if you’d like to share your commuter experiences, contact wwbikeped@gmail.com. 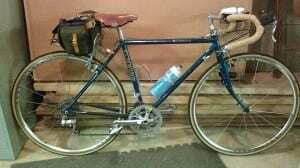 2014 marks my 30th year of commuting by bike. At this point bicycle commuting isn’t just a passing phase, it’s part of what defines who I am. For the first year out of college I didn’t own a car. Living in West Philly, cycling was faster and cheaper than any other way I could get to my job in Center City. Back then I’d wear my shirt and dress pants and carry my suit jacket and tie in a backpack. I could park outside the building entrance, while most of my co-workers had to walk several blocks from lots where they’d paid to park. I kept a massive chain and lock locked around the bike rack directly outside our office building so I didn’t need to carry it back and forth, and the building security officers could see the bike. I only had a few miles to ride, so washing up in a men’s room was all I needed. Without spending my income on car payments, insurance, maintenance, parking, or gas, I was able to save enough for a down payment on a house much sooner than my peers. When I got a work assignment in Phoenixville, I moved to Devon and regularly bicycled through Valley Forge park to get to work. That was 12 miles and fairly hilly. So I didn’t do it every day. After my wife and I moved to Media, PA, I was able to find a bike trail that took me to the plant where I worked in Eddystone for a few years. I was mostly a warm weather commuter until I got a job in Princeton and we moved to Pennington. After commuting by bicycle for a decade, I realized that it was a pretty high priority in my life. So I drew a nine mile radius around my new office and told the realtor we’d only consider looking at houses within that circle — and she needn’t bother showing us anything that involved crossing Route One. Year by year I’ve sorted out what it took to ride comfortably in any weather. I ride 12 months a year but avoid the road when there’s a risk of ice or snow cover. My lifetime bike odometer should pass 85,000 miles this year. I expect to pass 100,000 miles before I retire. Not all of those miles were commuting. I’ve done fifty or sixty century rides, earned a Super-Randonneur award along the way. I’ve done some other ultra-distance riding, some very fast “training” rides with triathletes and solo, and dozens of bicycle camping trips with my children. We live in a pretty neighborhood with more property and a larger house than we could afford in Princeton. I enjoy a few miles of rural riding past cows and sheep, then a few miles of county routes that have steady, 45 mph traffic but great wide shoulders, then a few miles of urban traffic in downtown Princeton. It’s a wonderful mix. My 7 ½ mile ride takes 35 minutes at a natural pace. I carry books, phone, and clothes in panniers and shower when I arrive. The fastest I’ve ever done the ride was 25 minutes home-bound — just after my wife told me she’d started labor with our second child! He’s now deciding on which college to attend. As our kids grow up, my wife and I are beginning to do more and more riding together and anticipate seeing foreign countries by bike in retirement. But we have four college educations to pay for, so I expect to be bicycle commuting to work for at least another decade! Our guest commuter this week is Mike McCormick – if you’d like to share your commuter experiences, please contact wwbikeped@gmail.com. Since July, 2007 I’ve commuted just about 25,000 miles by bicycle from my home in Allentown (NJ) into Trenton – about a 25 mile round trip each day. I’ve found it to be a great way to begin and end each day, with a few notable exceptions due to bad weather, and/or worse drivers. For the most part, I’ve remained unscathed, thanks to some brightly colored clothing and a lot of lights. During the winter months, it’s been said that I’m a cross between a Christmas tree and a Las Vegas casino, blinking and flashing my way down the street. I do draw the line at ice or snow covered pavement, of which there has been plenty this past winter. I’ve been reminded of how much I dislike traffic, interstate highways and parking lots that seem to be a mile away from my office door. There are many instances when my bicycle is the fastest vehicle on the streets of Trenton, and to date, no one has taken my indoor parking spot: a sewage pipe in the basement of the Hughes Justice Complex, to which I chain my bike each day. After almost seven years, it is hard to imagine how – or why – others insist on driving to work each day! Please welcome another guest commuter, Melinda Posipanko, this week – if you’d like to share your commuter experiences, contact us at wwbikeped@gmail.com. I seem to have had this conversation with someone almost every day this winter: Question: “Did you ride in today?” My answer: “Yeah. It wasn’t too bad out.” Reply: Either 1)”Wow”, 2)”You’re insane”, 3) “Impressive”, or 4) a sad shake of the head. Now to be completely transparent, “riding in” for me means a 1.5 mile ride from my house to the Princeton Junction train station. Not exactly a grueling bike commute. And I’m nobody’s idea of a “cyclist”; more tortoise than hare and riding an el-cheapo bike I bought at Kmart 5 years ago. Let me be clear. I HATE COLD. So why have I gotten layered-up every morning to bike commute? It’s not a simple answer. I’m not crazy (at least not completely), but I really love using my body to move itself from one place to another. I ride my bike, I take the stairs when practical, and I usually take the easy-to-find far out parking space at the mall. Moving my body feels good. And even a short bike ride in the morning can make a huge difference in my overall energy level for the day. It makes some practical sense, too. It used to take me just about the same amount of time at the end of the day to walk to my permit parking space as it now takes for me to ride home. I don’t have to clean off my car when it snows. 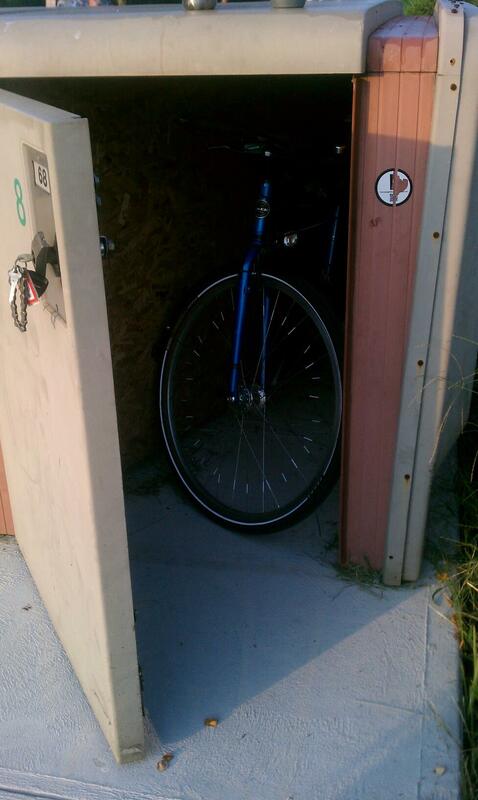 Now, I pay $22.50 /quarter to rent a bike locker instead of $120/quarter for a parking space. But really, I think it’s mostly the sense of accomplishment I have when I make it to the train under my own power no matter what Mother Nature throws at me. Me against the world…that sort of thing. I’m proud of the fact that I’ve driven into the station fewer than 10 times since October – and only then on days when the roads were clearly not safe. And I’m obviously not alone. I’ve seen bike riders and empty CitiBike stalls all over NYC even on the coldest days. So I’ll continue to suit up and head out every day that I can. And keep looking forward to spring! How far is your commute? For me it is almost a trick question. The first half of my commute is 35 miles – snaking through Trenton, Bordentown, Mt. Holly and eventually to my office in Mt Laurel. For the trip home I “cheat” and use the RiverLine train for half the journey. The ride from my office to Riverside Station is 8 miles and then there is another 8 miles home from the Trenton Transit Station. The round trip is 50 miles. Except for this winter, I typically do this twice a week. I’ve come to cherish each piece of the route for what it is. The early morning ride on car-free roads that I would not normally be brave enough to travel. The smell of the Guatemalan bakery preparing the day’s treats. Watching the sun rise over Burlington County farmland. The trip home is the antithesis. Passing schools and playgrounds bustling with activity. Pausing for 40 minutes to read on the train and enjoy the camaraderie of regulars. And finally, riding through the City of Trenton with all of its urban vitality. It was Ernest Hemingway that said: “It is by riding a bicycle that you learn the contours of a country best, since you have to sweat up the hills and can coast down them.” Perhaps my route is too flat to fully appreciate Mr. Hemingway’s point. But then I think his observation misses the nuances of life that can be witnessed and appreciated by riding a bike. Please welcome Whit Anderson, our guest commuter this week – if you’d like to share your commuter experiences, contact us at wwbikeped@gmail.com. I love my commute. Rarely a weekday goes by when I am not appreciative of how lucky I am to have it. I bike commute from Hopewell Borough to Princeton University’s Forrestal campus, four or five times a week, all the year round. For the most part, my route is quite idyllic – lovely bike lanes on most of CR518 (I am working on Mercer County to address the parts lacking), scenic bike path on the Kingston Branch Loop Trail and a quick turn up to Mapleton where I give the bald eagles a nod if they happen to be nesting. When I get to my lab, a suite of bike lockers and racks are waiting for me, and inside we have showers and changing facilities. Yep, it is a pretty sweet deal. Even after describing my commute to people I still get the “you are crazy” comments. Most of the time I laugh and shrug it off – too bad for them, they will never know what they are missing. “Me crazy? They are crazy” – that’s what I would always say to myself. Then this winter happened. A few times this winter I caught myself agreeing with them – even with the multiple layers of wool and synthetics, the studded winter tires and a large thermos of steaming coffee I found myself thinking, “I am crazy”. But the thought never lasts long. As soon as I get to my destination the feeling of accomplishment washes away any lingering negativity. That, and the hope that spring is just around the corner. Come on spring.